Who were those artists and architects mentioned in the book? The artists and architects mentioned in The Lost Treasure of Tuckernuck were real artists that were all working in the US during the twenties and thirties, when Maria Tutweiler was preparing and opening her school. Pablo Picasso (1881-1973) was a Spanish painter and sculptor best known for co-founding the Cubist movement. His painting “Dove of Piece” was painted for the 1949 Paris Peace Conference, and quickly caught on, leading him to draw and paint more peace doves for other conferences. 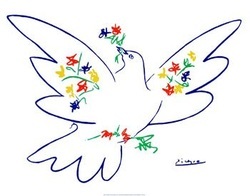 For more information about Picasso's Peace Doves, click here. For more information about Picasso, click here. Seriously, you don't know? Have you gotten to the end yet? If you haven't, go finish reading! It's right there on page 271! Henry Moore (1898-1986) was an English sculptor best known for his abstract works in bronze and stone, many of which depicted reclining figures. 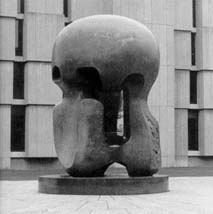 Nuclear Energy (shown on the left) is located on the campus of the University of Chicago, on the site on the first nuclear reactor. For more information about Henry Moore, click here. But where was his work in the book? Highlight below to find the answer. Henry Moore was the sculptor who did the weird carved stone statue out in the yard outside the school. 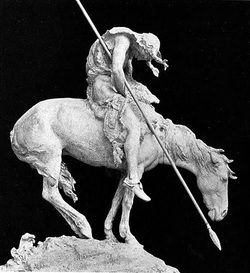 James Earle Fraser (1878 - 1953) was an American sculptor best known for his monuments of presidents and other historic figures, and for his famous statue, End of the Trail. For more information about James Earle Fraser, click here. Can't figure out where he was in the book? Highlight below for the answer. He did the bust of Homer! Mrs. Hutchins reads about it on the bottom of page 271. Alexander Calder (1898-1976) was an American sculptor who invented abstract sculptures called mobiles, and large metal stationary sculptures called stabiles. He also was known for his portraits made out of wire. 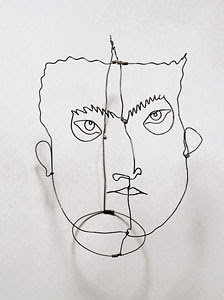 For more information about Alexander Calder, click here. But I don't remember him in the book. Where was he? Highlight below for the answer. Jose de Creeft (1884-1982) is a Spanish born American sculptor, best known for his technique of direct carving in wood and stone. 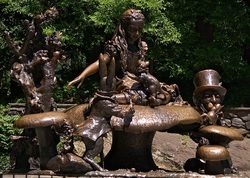 He also worked in bronze, and his Alice in Wonderland sculpture (shown on the left) can be seen in Central Park in New York City. For more information about Jose de Creeft, click here. Were his carvings in the book too? Highlight below for the answer. He did the carvings of the founding fathers in the history hall, seen on page 178. 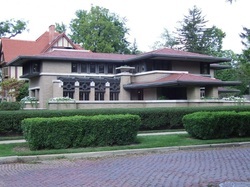 Frank Lloyd Wright (1867-1959) was the American architect known for developing the Prairie School of architecture, which used "organic architecture" to create harmony between the structure and the environment. To find out more about Frank Lloyd Wright, click here. Charles Eames (1907–1978) began his career as an architect, and with his wife Ray, became one of the country's most influential designers of furniture and architecture. 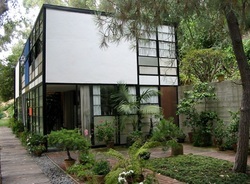 For more information about Charles and Ray Eames, visit this site. Okay, you got me. This guy's made up.